Today we’re looking at the best dog names that start with J.
Welcoming a new puppy or rescue dog into your life is such an exciting time! And you’ve decided to choose a name for your dog that starts with J! Are you looking for inspiration and ideas? In this article, we list plenty of excellent dog names, many that start with J. 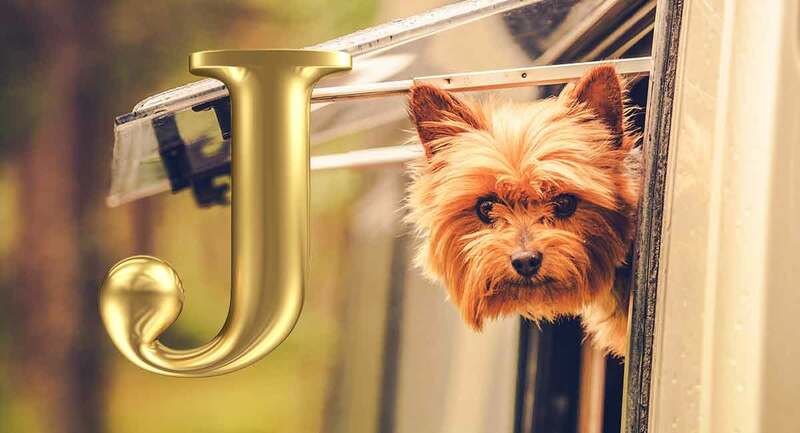 Although J is not the most commonly used letter of the alphabet, we’ve found a whole host of great names for dogs that start with this letter. So let’s get started on helping you to find the ideal dog name that begins with J for your new furry family friend! No matter what kind of name you want for your new pup, you must choose one that the little guy will find it easy to remember. That means choosing a short, snappy name not a long, complex one. The main reason for picking a short name is that a long name will be very difficult for your dog to memorize. Also, you’ll need to ask yourself what would happen if you were calling out your dog’s name on a windy day in a park full of barking dogs. Will your dog be able to hear and understand the name you’re calling? Dog names with only one syllable are the best way to go. Dogs listen to the words we say and to how we say them too. Also, it’s thought that words with hard consonant sounds and very distinctive vowels are the easiest for dogs to hear and remember. For example, Jake would be a great choice for a dog name that starts with J.
It’s short, and the sound is very distinct. Of course, if you think of a long dog name that begins with J that you love, you can still use it. All you have to do is abbreviate the name to a snappy nickname that your dog will easily be able to learn and remember. A really good place to look for a wide range of names that start with J is a baby name book, just like this one. Baby name books have hundreds of names that begin with J, many of which would be an ideal fit for your new dog. Books like these also contain the meaning of every name too, making it a breeze to find a name that’s ideal for your dog’s looks and character. There are quite a few very popular dog names that start with J. If your new dog is female, you’ll need to find a great female dog name for her that starts with J. The good news is that, along with a whole load of female names beginning with J, there are plenty of names that can be used for a boy and a girl dog too! The perfect name might just be hiding in there somewhere! To a large extent, the name you choose for your dog will depend on her character and breed. So if you’re getting a tiny, dainty dog such as a Bichon Frise, you’ll want a tiny, dainty name! If your new furry friend is a Great Dane, a big, strong name would fit the bill. Check out our article at this link for a whole list of great female dog names. If your new arrival is going to be a boy, there are plenty of great dog names that start with J for you to pick from. Lots of the names we’ve listed here would suit a male or a female dog. So if you see something you love, why not pick a unisex name? Check out our article at this link for a few more ideas, or keep looking over the list below. If you think your dog is cool, you’ll need a cool dog name that starts with J! The article at this link includes hundreds of cool dog names, and lots of them start with J. Lots of dogs are cute! If your new four-legged chum is a real cutesy pup, you’ll want a cute dog name that starts with J to fit him or her. At this link, you’ll find plenty of cute dog names that might be the perfect choice for your cutie pie! Some people like to pick names for their pets that reflect their sense of humor. And there are quite a few funny dog names that start with J. If you pick a funny dog name, make sure you won’t offend others. Also, some jokes can become irrelevant over time, so today’s in-joke might not be quite so funny tomorrow. Your dog is one of a kind. He’s unique, so he deserves a unique dog name that starts with J.
Here’s an article with lots of unique dog name suggestions. Some dog breeds look tough, even though they may be big softies at heart! If you have chosen a tough-looking pup, you may like the idea of giving him or her a tough name that starts with J. We have more tough dog names at this list here. Here are a couple of fun facts about dog names that begin with J that we bet you didn’t already know! Did you know that the top dog name beginning with J is Jake? So if you don’t want to end up calling a dozen dogs in the dog park as well as your own, don’t pick this name for your new pup! The American Kennel Club recognizes three breeds of dog that have names beginning with J: the Jagdterrier, Japanese Chin, and the Jindo. The Jack Russell Terrier is not recognized as a breed by the AKC, although it was accepted by the UK Kennel Club in 2016. Congratulations on your new puppy or rescue dog! You must be way beyond excited right now! We’d love to know what name you picked for your new pet, especially if it’s one of the dog names that start with J that you found in one of our articles. Share your new pup’s story with us in the comments section below!